Obituary – Lumbers, Mable “Judy” (Stalter) « Perry High School Alumni Association, Inc.
﻿Judy Lumbers, 90, 908 Delaware street, died at 7 p.m Tuesday, April 2, 1996, at Perry Nursing home. Funeral service has been set for 10 a.m. Thursday at St. Rose 01 Lima Catholic church. Rev. Kevin Devlin, pastor, will officiate. Burial will be in St. Rose of Lima Catholic cemetery under direction of Brown Funeral home. The Judy Lumbers Memorial has been established at Exchange Bank and Trust Company. Mrs. Lumbers was born in Pacific Grove, CA, on Oct. 2, 1905, the daughter of Fred and Grace Stalter. 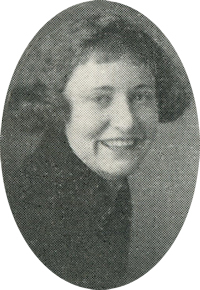 She was a 1923 graduate of Perry high school and attended Oklahoma A&M where she obtained her teaching certificate. In 1924, she and Avery Lumbers were married. She taught in Noble county rural schools and had worked 13 years as a nurse aide at Perry Memorial hospital. Mrs. Lumbers was a member of St. Rose of Lima Catholic church and its Altar Society. In addition to her husband, survivors include one son, Robert Lumbers, Perry; two granddaughters, Sharon Skouby, Allen, TX, and Bridget Stovall, Douglas; one grandson, Mike Lumbers, Perry; seven great-grandchildren and one sister, Hazel Merriman, Tulsa.